Most people love to share their memories or happy incidents in the form of videos with others, what if they will be paid for sharing their videos? I think there will be no one who does not know that youtube pays for sharing videos on YouTube, but most of the newbies don’t know how? 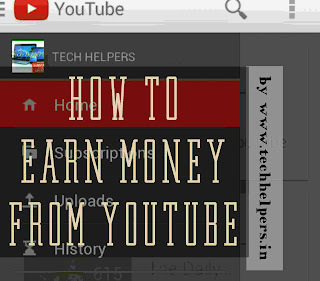 So here is the procedure to earn money via YouTube. How to monetize videos on YouTube? Those who share videos on youtube will be paid if they will Share their own made videos on youtube. But they have to monetize their videos to get paid by youtube. To monetize videos on YouTube. One should have an account in any monetization service provider like “Adsense”. If you don’t have that yet. Make a new Adsense account by visiting AdSense with the help of Gmail account. If you don’t have a Gmail account yet (which is rare).Then Create a new Gmail account by visiting Gmail here. After that go to YouTube and log in using that email id. Now create a new channel (if you already have a channel, then leave this step) and choose a good and attractive name for that channel. Now you can upload your video and monetize that. There are some requirements for monetization of videos and approval of AdSense account. 1. Your videos should be your original contents. 2. You should not upload videos of others (copyrighted) on your channel. 3. There shouldn’t be audio contents of others(copyrighted) in your videos. 4. You shouldn’t upload Offensive videos. 5. If you are under 18, you shouldn’t upload adult videos. Note: Violation of any rule from the above 5 rules will lead to the termination of your youtube channel permanently or temporarily for a month at least. So before uploading any video keep in mind about these 5 points. Note: If you are under 18, you cannot apply for Adsense account by your own name, but You can apply by your father’s name. But when we apply for an Adsense account it is not easy to get approval from AdSense, as every youtuber and website/blog owner wants to get their contents/videos monetized by AdSense and they apply for the AdSense account among which almost only 40% of the accounts get approval by the AdSense. why? because almost 60% of the appliers don’t know the right procedure as well as rules and regulations for applying AdSense account. How to get Adsense account approved from Google within a day? • Log in with the that YouTube account on which you will upload your videos. • Click on the menu which will be on the left side. • A new popup window will be there now. • There Will be an option available called verify, click on it and enter your number. A confirmation code will be sent to your mobile number, enter that and Verify as a partner. ===> Note enter that mobile number which you will be using at the present time. • A popup screen will arise in which congratulations message will be written, click on continue. • After all this scroll down. There will be an option of “monetization” click on it and enable it, a popup screen will be there with a message that you are enabling monetization etc. • Again a new popup screen will be shown to you in which you have to select two options by checking both the boxes. Click on I accept and a new popup window will open in which you will be asked to link your Adsense account with your youtube channel, click on the link my account. • Now you will be redirected to Google Adsense. Click on sign in and Fill up the required information and your email id( must be a Gmail id). • Now a new window will be there in which you will be asked to enter your website, enter your youtube channel URL or it will be already filled with your channel URL and select your language. • Click on continue and a new popup window will be shown to you in which you will be asked to fill your address, payee name etc.fill your details carefully as you will receive a verification pin at your residence. • Click on submit my application and you will be redirected to youtube. Your Adsense account can be approved from 1-4 days. • When your AdSense account will be approved, you will get an email. • Now you can Go to youtube and click on video manager now click on the checkbox of that video which you want to monetize.now click on actions which will be above all the videos and there will be monetization option, click on it and mark the check boxes and click on continue. From march 2104 AdSense added one more twist in their service that is EFT system in integrated for indian adsense publishers,through EFT system indian publishers will get their earnings directly on their bank accounts rather than cheques. which is very good for indian adsense publishers. How to get more views on your videos? 1. Select a channel name which you think is more attractive or most searched on google/YouTube. 2. Create videos which will be different than others and which should be original due to which a YouTube surfer should think of watching it again and again. 3. Quality of video should be good as people want to watch your video, the if quality is not good then they will not like to watch it again and again. 4. Sound quality should be good, either if you include music or it the is only voice. 5 Try to make videos more than 3 minutes and less than 10 minutes, as videos mote than 3 minutes are mostly watched whether funny, scary or tech related and videos more than 10 minutes are not been watched by the viewers as they feel it is a long video and will get bored. 6 Try to reach more and more audience by social media like sharing your uploaded video links to facebook groups, Whatsapp groups or on Twitter. 7 Build your subscriber base, which means try to motivate viewers to subscribe your channel by asking them in your videos to subscribe to your channel. By building a subscriber base, whenever you will upload a video on youtube, your subscribers will be notified. 8 Go to your channel and there will be two options, one will be featured video, select one of your video and another option will be branding, click on it and select any of the small image like i used subscribe due to which i try to tell my viewers to subscribe my channel. 9 Go to the video manager and click on edit video(edit option will b e available in front of every video). 10. Click on advanced now and add cards, annotations according to your videos. 11. In tags, put those tags which are most searched in youtube/google. There are several other youtube tips to increase views and subscribers which i have covered in part 2. I have explained these 11 tips there as well so if you couldn’t understand these tips from here , do read our part 2. Tell us if it worked for you and if you have more suggestions/tips tell us in the comment box below. Hope we have covered all these questions, how to improve youtube channel/how to get more views on our videos, how to improve youtube views? How to get more subscribers? There is another article in which i have explained almost all the tips regarding youtube to increase views and subscribers. That article is very helpfull to newbies and starters. That was very informative. I had no idea YouTube paid for videos. I am emailing this to my company thanks. I also didn't know your could monetise on YouTube. The step by step process is most useful, thank you. awesome post, thanks for the tips. I am not ready to start with a youtube channel right, now but when I am, I am going to remember this post, blessings! I've never monetized my You-tube channel! Maybe now I'll look into it! Thanks for sharing such a valuable information! Such brilliant laid out information. Arigato for the great insight and advice shared. This is really cool! I've been contemplating incorporating video into my blog and now I understand how I can add video and get paid Thank you!